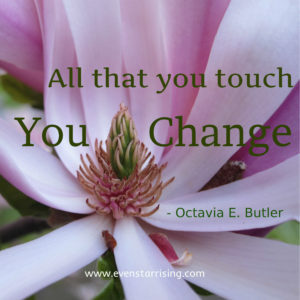 The words of Octavia E. Butler have been swirling in my mind over the last few months. In her novel The Parable of the Sower, the protaganist writes verses that begin each chapter. To me, they are sacred words – holy reminders of the delicate interplay between God, ourselves, and change. These words give me hope. It can be easy in chaotic times to give away our power, to consign ourselves to being changed by our circumstances in ways that we would likely not choose. What a glorious reminder of our ability to impact the world, this remembering of our role in this vast and interconnected universe, this net of Indra. Yes, change is the only lasting truth. Yes, we effect change and are therefore part of that sole lasting truth and of God. That, dear ones, is power. Power to claim and stand upon our sacred ground. Power that gives us great responsibility, for what we touch is what changes. How we touch it must also impact how it changes. This world and all of its beings are in dire need of more light, more love. So tread lightly. Touch lovingly. You are Change incarnate.